It is hard to imagine a person who embodied the ideals of postwar Canadian foreign policy more than diplomat and scholar John Wendell Holmes. 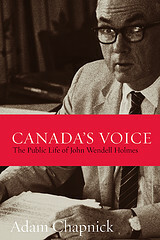 Holmes joined the foreign service in 1943, headed the Canadian Institute of International Affairs from 1960 to 1973, and, as a professor of international relations at York University and the University of Toronto, mentored a generation of students, scholars, and policy-makers. Accessible and engrossing, this is the only comprehensive biography of a man whose tireless work ethic, commitment to peaceful forms of conflict resolution, and unyielding desire to make a difference in the world helped shape foreign policy during Canada’s golden age as a middle power. It will be of interest to students and practitioners of international affairs and foreign policy and anyone interested in Canada’s role in the world. John Wendell Holmes: A hunted hero. UN Advocacy Director for Human Rights Watch Outlines Role of NGOs at Glendon’s Holmes Lecture.